Donovan Brown | I can’t see my custom build steps in the list of build steps during a team build. ← Add validation rule to every request. 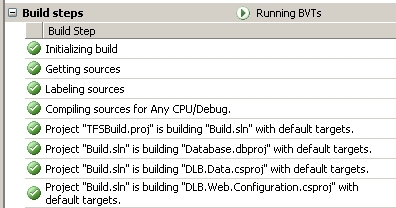 Use BuildStep element in tfsbuild.proj file. Now when I run my builds I can see my custom steps with a Play icon while running and a check or X when finished. As you can see below you can see the Running BVTs build step. The “Copying files to IIS.” was also added this way.